If you just need to top off your phone halfway through the day, you can buy any of a dozen portable chargers. 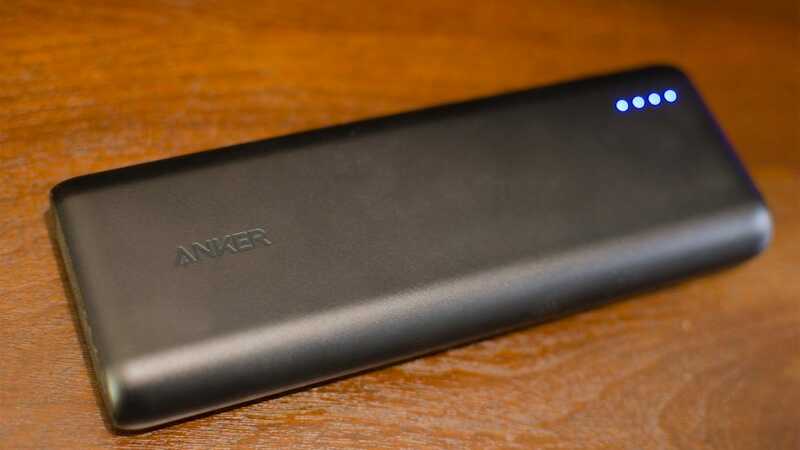 If you need a mega charger to power your phone five times, top off your tablet, or even fill a laptop battery—and do it all fast—you want Anker’s cumbersomely-named PowerCore Speed 20000 PD. That USB-C port on the right is going to be your friend for a long time. The PowerCore Speed 20000 PD ($99)—which we will henceforth refer to as the PowerCore for brevity (though there are many models of PowerCore so be careful when shopping)—is a massive charger that leaves some of the more outdated elements found in other chargers in the past. Unlike most portable chargers, the PowerCore features one USB-C port (instead of the usual micro USB port) and one regular USB-A port. Both can be used to charge your gadgets, but the USB-C port is used to recharge the battery itself. This is the most immediately forward-looking feature found on this charger. If you have a recent Android phone (or even some modern laptops), you’re already in the process of switching to USB-C. The inclusion of USB-C makes for one fewer gadget you need to keep micro USB cables around for. More importantly, this PowerCore supports fast-charging for compatible devices using USB Power Delivery (denoted by the “PD” in its extremely long name), outputting power at up to 22.5W. This is Google’s preferred fast charging method and it works with plenty of devices including phones like the Galaxy S8, Pixel 2, all the way up to newer laptops like the latest Macbook Pros. 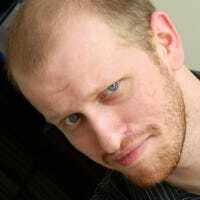 Unfortunately, the industry still hasn’t settled on a single fast charging standard for all devices, but USB-PD is looking like a strong contender for, at the very least, a solid fallback option on most modern devices. 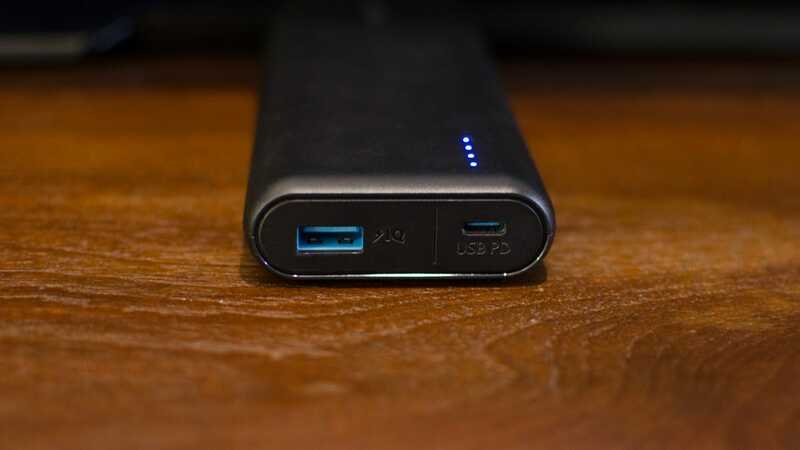 A USB-C port and fast charging would already make the PowerCore a solid future-proof power bank, but the 20,100 mAh capacity makes it a beast. That’s enough capacity to completely recharge multiple phones (or one phone several times), or even fully charge a Macbook Pro once. With a fully charged PowerCore, you could be away from a power outlet for a long weekend and still keep your phone powered on. Great news for whatever camping spot you found with cell service but no power outlets. The included fast charger makes the $100 price tag more palatable, but sticker shock is sticker shock. The PowerCore has a lot of advantages over the competition, but budget pricing is decidedly not one of them. At the time of this writing, it’s going for $79 on Amazon, but normally retails for $99. That’s tough to stomach when even Anker itself offers a similar 20,100 mAh battery for $42, without the USB-C or fast-charging features. Other manufacturers have batteries with massive capacities for even less. However, that price tag has a small silver lining: the PowerCore includes a fast-charging wall block, which, naturally, it needs to quickly charge itself. Standalone fast wall chargers can already cost $20-30 and with that in mind, if you’re already in the market for a fast charger, you’re getting a two-for-one deal with this battery. That makes the price tag more appealing, especially if you buy one while it’s on sale. The current $79 sale price, minus the ~$30 you’d have to spend on a separate fast charger, means you can get a mega battery pack with fast charging and USB-PD for the price of a generic high-capacity battery back without those features. Price tag critique aside, it’s really hard for a portable charger to impress the way this PowerCore does. Any battery can charge your phone, but fewer can also handle your tablet or your laptop, and do it fast. 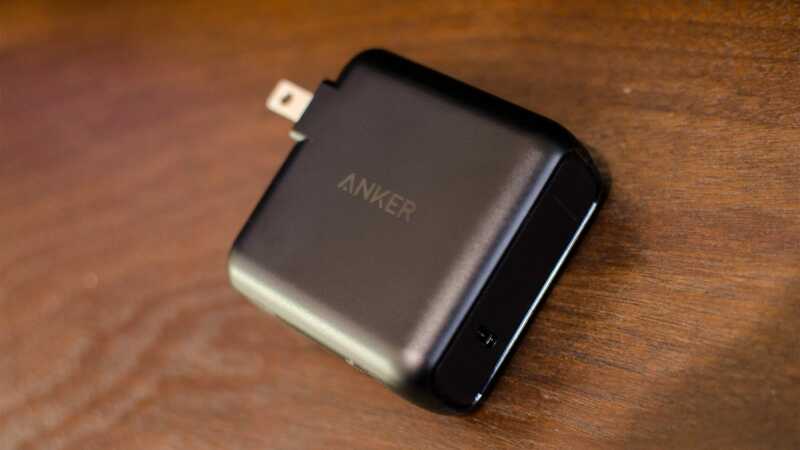 The ideal buyer for this one is someone who also needs a fast wall charger, but if you can get past the sticker price, you’ll have an excellent and strongly future-proofed power bank.